Composite materials have increasingly been used in construction and in the aerospace and automotive industries because they are lightweight, strong and corrosion resistant, and because their anisotropic properties can be controlled; maintenance costs are also low. However, there is a growing demand for improved composite materials which have 'smart' capabilities, that is, they are able to sense, actuate and respond to the surrounding environment. Shape-memory alloys (SMAs) possess sensing and actuating functions. Embedding SMAs into composite materials can create smart or intelligent composites. Amongst the commercially available SMAs, NiTi alloys - in the form of wires, ribbons or particles - are the most widely used because of their excellent mechanical properties and shape-memory performance. These materials have found application in broad fields of engineering and science as a result of their superior thermomechanical properties. Here we review the use of NiTi SMAs in applications such as vibration control, shape control, position control and adaptive stiffening. Composite materials are increasingly used in construction and in the aerospace and automotive industries because they are lightweight, strong and corrosion resistant and their anisotropic properties can be controlled.1 The high specific stiffness and strength characteristics of composites have increased their application in various engineering structures over other engineering materials.2 However, there is a growing demand to improve on composite materials to enable 'smart' capabilities, that is, so they can sense, actuate and respond to the surrounding environment. Shape-memory alloys (SMAs) are metallic alloys that can undergo reversible martensitic phase transformations as a result of applied thermomechanical loads and are capable of recovering permanent strains when heated above a certain transformation temperature.3 SMAs possess sensing and actuating functions and have the potential to control the mechanical properties and responses of their hosts as a result of their inherent unique characteristics of shape-memory effect and pseudoelasticity.4 When integrated into structural components, they can potentially perform sensing, diagnosing, actuating and repair or healing functions, thereby enhancing the performance characteristics of their hosts. Amongst the commercially available SMAs, NiTi (nickel-titanium) alloys are the most widely used because of their excellent mechanical properties and superior material characteristics regarding shape-memory performance, good processability, good corrosion resistance, cyclic stability, wear resistance and biocompatibility, which allows them to be used in the biomedical field.5,6 We present a concise review of the applications of NiTi SMAs in composite materials and the ways in which their performance characteristics can be improved. NiTi SMAs can exist in two crystal phases: (1) the stronger austenite (or parent) phase which is stable at high temperatures and (2) the softer martensite (product) phase which is stable at low temperatures.7 The NiTi SMA in its martensitic phase can be easily deformed because of its relative softness. The austenite phase has a well-ordered body-centred cubic structure that presents only one variant. The martensite phase has a lower symmetry and may exist in multiple variants depending on the type of phase transformation. 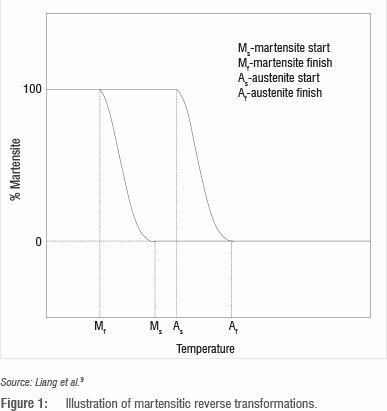 Therefore, although there are several ways by which martensite can be formed out of austenite, there is only one route by which the martensite formed will revert to austenite. The understanding of the characteristics of NiTi SMAs such as SME and pseudoelasticity, is important in the design and implementation of NiTi-based devices. One-way SME (or pseudoplasticity), schematically shown in Figure 2, begins from the high-symmetry austenitic phase. 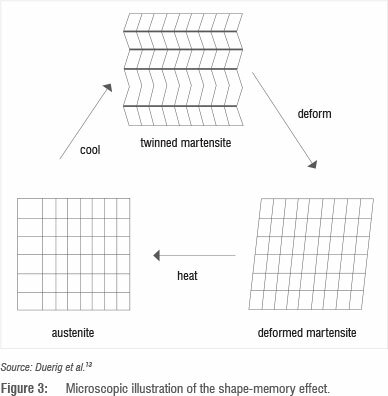 After cooling to martensite, the material undergoes permanent deformation, and then reverts to its undeformed shape when heated above the transition temperature. The two-way SME, schematically illustrated in Figure 4, is the preferential creation of certain variants of martensite that are energetically more stable and depend solely on temperature. Two-way SME is achieved by a thermomechanical treatment known as training in which the SMAs are 'made' to remember a predetermined geometrical shape at high temperature (greater than Af) and another shape at low temperature (lower than Mf).14 The SMA is severely deformed at a temperature below M( When the deformed martensite is heated above Af, the SMA reverts to its original shape and, upon subsequent cooling, it returns to the deformed shape. Pseudoelasticity (also known as superelasticity) is the ability of the NiTi SMA to return to its original shape upon loading after substantial deformation.15 This functional property of NiTi SMAs is present at almost constant deformation and constant temperature (Figure 5). 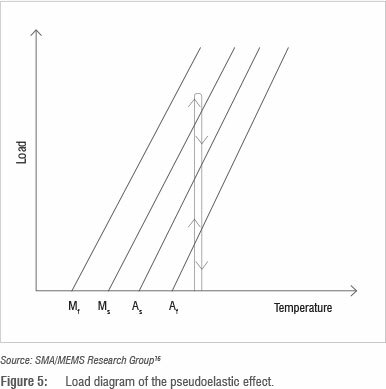 Generally, pseudoelasticity refers to the observed non-linear unloading characteristics, while superelasticity is associated with the stress plateau and inflection point upon unloading as shown in Figure 6.17 Unlike the SME, in which martensite is formed when the SMA is cooled to below Ms, pseudoelasticity occurs when the SMA is composed entirely of the austenitic phase. 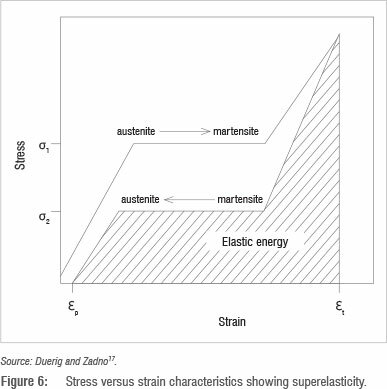 Under the application of stress, the austenite is transformed to martensite and upon the removal of the stress the martensite reverts to austenite. The martensite formed via this transformation is known as stress-induced martensite. Despite the excellent thermomechanical properties of NiTi SMAs, research has been conducted on methods to improve on their performance characteristics. It has been shown experimentally18 that thermomechanical cycling and aging erases the non-homogeneous transformation and inconsistent yield strength of NiTi SMAs. Uchil et al.19 studied the stability of the R-phase during thermal cycling for near equiatomic, 40% cold-worked, NiTi wire samples using electrical resistivity measurements. The NiTi wire samples are heat treated at higher temperature ranges and show only M↔A transformation during the first cycle and Ms decreases along with the onset of intermediate R-phase. Uchil et al.19 established that for NiTi, for any heat-treatment temperature above 420 °C in which only M↔A are present, the effect of thermal cycling on the transformation behaviour is identical. The number of critical cycles needed to stabilise the R-phase continues to increase with an increase in heat-treatment temperature and this number tends to be a constant above 520 °C. The use of NiTi SMAs in engineering and science applications is a result of their unique characteristics. A considerable amount of work has been done in the area of embedding NiTi SMAs into composite structures, with the objective of obtaining a better understanding of the effects that embedded NiTi SMAs have on the material properties and behaviours of the resulting composite structures.20 Philander21 developed an engineering computational design tool that can be used for the design of NiTi SMA wire based smart or intelligent actuators that exploit SME for their operation. Hybridised composite materials have the ability to alter their stiffness properties when the NiTi SMAs are activated. The hybridised composites can also be utilised in shape and position control as well as for vibration control. Whereas the active use of NiTi SMAs is based on the SME characteristics, the passive application, such as vibration damping, is a function of the pseudoelastic effect. Baz et al.22 studied the feasibility of using NiTi actuators in controlling the flexural vibrations of a flexible cantilevered beam by modelling the beam dynamics using the finite element method. They integrated the thermal and dynamic characteristics of the SMA to develop a mathematical model of the composite beam-actuators system. They confirmed that at the time of activation, when the beam is subject to step displacement, the actuator shrinks and exerts a force which provides the restoring control movement. They established that NiTi actuators are feasible for vibration control applications and can be extended to control higher mode shapes via implementing sophisticated control strategies such as a time-sharing strategy. Ni et al.23 investigated the vibration characteristics of laminated composite plates with embedded SMAs. They found that the natural frequency of the SMA-based composite plate is a function of the volume fraction of the SMA. At a temperature of about 100 °C, when the SMA is in the austenite phase, the natural frequency of the SMA-based composite plate is almost twice that of a laminated plate without an SMA implant. In the case of woven SMA-based laminated plates, they reported that the natural frequency increased by 1.8 times when compared to laminated plates without SMA implants. They established that the use of SMA wires and woven SMA mesh is an effective way to implement damping control in practical material structures. Kim et al.24 studied the vibration of thermally post-buckled composite plates embedded with NiTi SMAs. They reported that an increase in the volume fraction and initial strain of the NiTi SMA fibres resulted in a stiffer plate and hence increased natural frequencies, lower thermal deflections and higher critical temperatures. They also reported that, in the pre-buckled region, the presence of SMA in the composite plate increased its natural frequency as a result of the recovery stress of the SMA. However, in the post-buckled region, the natural frequencies of the SMA-embedded plates were lower than those without SMA. Nevertheless, they established that SMA fibres can be used to control the vibration behaviour of composite structures, modification of natural frequencies, critical temperatures and thermal deflections. Turner25 investigated glass-epoxy composite laminates embedded with 5% pre-strained NiTi SMA actuators under thermal and acoustic loads for dynamic response abatement applications. Turner25 also investigated conventional composite laminates with and without additional composite layers subjected to thermal and acoustic loads. He reported that as little as 13% volume fraction of SMA will completely nullify thermal post-buckling over a small temperature range and that embedding SMA wire actuators into hybrid composite laminates is more effective in increasing the fundamental frequencies and reducing the amplitude of dynamic response when compared to stiffening the hybrid composite laminates by adding additional composite layers. He established that an enormous reduction in dynamic response can be achieved by embedding SMA actuators into composite laminates. Gordaninejad et al.26 investigated the transient response of a thick polycarbonate composite cantilever beam which had SMA reinforcements embedded along its neutral axis. Under the influence of a harmonic force excitation exerted as a point load at its free end, they reported that the vibration amplitude of the composite cantilever beam depends on temperature, activation voltage, SMA layer thickness, beam length and the martensitic residual strain. They established that the thicker the SMA layers are, the greater the reduction of vibration amplitude. Their results confirmed that embedding thin SMA layers in such a beam was an effective way to actively control beam vibration. Mei et al.27 studied the vibration of rectangular graphite-epoxy laminated composite plates with and without embedded NiTi SMA fibres at elevated temperatures. They found that an increase in the volume fraction and pre-strain of the NiTi SMA results in a stiffer plate. They also found that at temperatures lower than the critical buckling temperature, the recovery stress generated by the SMA overwhelms the stress caused by thermal expansion. They reported that the large recovery stress generated by the NiTi SMA increases the stiffness, the critical buckling temperature and the natural frequency of the SMA embedded composite plate. They established the effectiveness of embedding SMA for frequency tuning and vibration control at elevated temperatures. Tsai and Chen28 studied the dynamic stability of a NiTi SMA fibres reinforced composite beam subjected to an axial periodic dynamic force. They confirmed that the dynamic stability is a function of temperature, the volume fraction of the NiTi SMA fibres and the pre-straining of the wires. The higher the temperature, the more stable was the composite beam. They reported that an increase in the number of the NiTi SMA fibres increases the stiffness of the composite beam and hence increases the buckling strength; the presence of the NiTi SMA fibres increases the stiffness of the composite beam and thus enables a more dynamically stable composite beam. Meo et al.29 investigated the impact damage behaviour of carbon fibre-epoxy composite plates embedded with NiTi SMAs. They found that because of the superelastic and hysteric behaviours of SMA wires, their implementation improves the strain energy absorption capability of the composite plate, thus increasing its overall bending and shear elasticity, and hence reducing ply failures. They also found that the closer the SMA wires are to the impact location, the greater the effect of the SMA wires on the absorption of impact energy, particularly on the contact deformation, the global bending deformation and the transverse shear deformation. They confirmed that increasing the density of SMA wires significantly reduces ply failures of the composite plate. They established that for low-velocity impacts, embedding SMA wires can be an effective way to increase the impact damage resistance of hybrid composite structures when compared to conventional composite structures. Armstrong and Lilholt30 investigated the time-dependent, super-viscoelastic behaviour of low-density polyethylene matrix material embedded with NiTi fibre reinforcements when subjected to an isothermal tensile cycle composed of a constant strain rate tensile loading followed by a constant stress rate tensile unloading. They reported that the qualitative behaviour of the SMA fibre reinforced composite was primarily dependent on the fibre mechanical response. This finding is as a result of the SMA fibres possessing higher strength and stiffness than the polymeric host. They established that the NiTi fibre actuated viscoelastic low-density polyethylene matrix composite exhibited large increases in strength, stiffness and shape recovery energy in comparison to the homogeneous polymer matrix. Zhao and Zhang31 investigated the thermomechanical properties of a composite asymmetrically embedded with an SMA layer. They found that the beam deflection depends on the thickness of the SMA layer and the moment generated by the SMA. They also found that, whereas an asymmetric SMA layer results in moment generation in the beam, SMA embedded symmetrically produces no moment. They confirmed that the more asymmetric the SMA layer, the greater the bending. They established that the thicker the SMA layer, the stiffer the composite beam and hence the smaller the composite beam deflection as a result of mechanical load. Kim and Roh32 studied the adaptability of a hybrid smart composite plate under low-velocity impact. SMA fibres were embedded within the graphite-epoxy composite plate and piezoelectric sensors were mounted on the opposite side of the impact. They found that at an elevated temperature, the elastic modulus of the SMAs increases in its austenite phase and results in a stiffness increase in the composite, which reduces the deflection. An increase in the SMA fibre volume fraction decreases the dynamic impact induced deflection. They ascertained that SMA fibres embedded within the layers of a composite beam can significantly enhance the global resistance of the beam to low-velocity impact. Lee and Choi33 studied the shape control of a composite beam with embedded SMA wire actuators. The SMA wire actuators were eccentrically embedded. The flexible composite beam was investigated under the action of axial compressive loadings. They found that the shape control of these composite beams did not depend on thermal moment but on initial geometric imperfection. They also found that the activation force generated by the activated SMA wire actuators results in either an increased buckling load or 'snap-through' of the composite beam. They reported that the dominant and decisive factor which influenced the shape control of the composite beam was the reactive moment generated by the SMA wire actuators recovery force. They verified the shape-control capability of SMA wire actuators when embedded in real composite structures which function in an unanticipated environment. Gangbing et al.34 investigated the active position control of a honeycomb structure composite beam with SMA wire embedded in one side. The cantilevered beam was activated by supplying appropriate current (ranging from 1.5 A to 3.0 A) to the SMA wires. They reported that the displacement of the tip of the cantilevered beam showed that the tip moved to the desired position. Their results demonstrated that the tip position of a composite beam can be precisely controlled by SMA actuators. Composites are used in applications that require lightweight construction. However, there is a need to improve on the performance characteristics of composite materials by engineering them to positively respond to their environment. SMAs possess the unusual characteristics of either SME or pseudoelasticity. These unusual properties, if properly exploited, can result in the generation of large recovery stress. A recovery stress of between 500 MPa and 900 MPa can be generated when the shape recovery of NiTi SMAs is constrained. Integrating SMAs into composite materials has the potential to create hybrid composites with smart capabilities and hence improved performance. A concise review of NiTi SMAs in general, and of the utilisation of these unusual properties for the control of vibration, dynamic response, stiffness, position and shape has been presented. As a result of their excellent biocompatibility characteristic, NiTi SMAs are being employed in surgical instruments, in cardiovascular, orthopaedic and orthodontic devices, and in robotics and satellites. The novel properties of NiTi SMAs can also be successfully exploited for damage repair in composite structures. This work was supported by the Faculty of Engineering, Cape Peninsula University of Technology, Bellville campus, Cape Town, South Africa. K.O.S. wrote the manuscript; O.L.A. is a researcher on the project and contributed to the manuscript; M.T.E.K. edited the manuscript; and all authors contributed to revisions of the manuscript.